If you live have a home in the French countryside, you may find that it has not been connected to natural gas. However, depending on where your home is located, it may be worthwhile getting connected to mains gas service. Find out all the main steps to raccordement (connection) to natural gas in France in our guide. Why Get Connected to Natural Gas? How Much Does Gas Connection Cost? Though it can involve a considerable up-front investment, in most cases connecting to natural gas is a worthwhile over the long run. Natural gas can be used for a wide variety of appliances and different uses (cooking, heating, hot water, barbecues, even tumble drivers can run on natural gas). Natural gas is a cheap, efficient fuel, and most people find that they save money after having converted to natural gas. If your home has not yet been connected to main natural gas service, you will need to contact the natural gas distribution operator GRDF to request a raccordement (connection). A subsidiary of the historical natural gas supplier Engie (formerly GDF Suez), GRDF distributes natural gas throughout most of the French territory (with the exception of Bordeaux, Metz, and Grenoble, which are covered by local distribution utilities). GRDF is responsible for transporting gas to end consumers, and is the main point of contact for new connections. While some suppliers offer assistance with the formalities associated with connection, keep in mind that it is ultimately GRDF who has the responsibility to carry out the work according to its fee schedule and timetable; the supplier is responsible for communicating and taking care of administrative steps with GRDF. The advantage of this option is to have a single point of contact for your gas connection. Check with your supplier, as this service may come at an additional fee. First, make a request for connection to the system operator either over the phone (09 69 36 35 34 - cost of a local call) or by filling out an online form (here - in French). GRDF will assess the feasibility of connection and will develop an estimatefor connection (based on the characteristics of your home). You will receive a quote for connection, which will outline the works to be done on public territory (which will be paid for by GRDF), and the work required on private property (which will be your responsibility to pay for), the work schedule, and the final cost. The first quote request is free, but subsequent requests for a quote may be charged. Work will begin once you have accepted the offer and have paid a deposit. GRDF will perform the construction works. It will take anticipate approximately three months (10 - 12 weeks) for works to begin once, starting from the date you made your connection request. The works themselves may take up to several months, depending on the complexity of the connection. Once they are finished, you will need to have the connection work examined and certified for quality control by Qualigaz. Qualigaz is an accredited private enterprise whose main role is to approve conformity of new gas installations with national regulations. Whenever work is done to a gas installation, whether it be modification, renovation, or new installation, you will receive Certificate of Installation Conformity (in French - Certificat de Conformité d'Installation - CCI), signed by the professional who performed the work. This certificate must be verified and validated by an inspection body that has been accredited by the Ministry of Industry. This is the work of Qualigaz: to check your compliance certificate and issue an official report attesting to the safety and quality of the installation. Connection costs will vary depending on whether the consumer plans to use natural gas for heating their home or simply for cooking. While connection costs may be higher if you are planning to use natural gas for heating, over the long run these costs will be amortized over time (as heating with natural gas tends to be more efficient and cheaper than other fuels). Important: the cost and time required for network connection are entirely the responsibility of GRDF, which remains the only network operator regardless of your supplier. Your choice of supplier will in now way affect the speed or the cost of construction works! It costs more to connect your home to gas for cooking and hot water than it does for heating. As heating is the main reason for connecting to the natural gas network, bears part of the cost of connection for this use because the installation will generate significant fuel consumption (and income for GRDF through transmission tariffs). Certification can be issued by a Qualigaz professional or by a professionnel du gaz (PG), which are often cheaper. The next step once GRDF has started work to connect your home to the natural gas system is to subscribe to an energy contract. 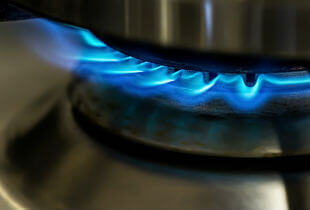 You will need to sign up for a natural gas supply contract with an energy supplier in order to activate your gas supply. As is the case with electricity, the historic supplier (in this case Engie/GDF Suez) supplies the regulated rates, but you are not obligated to start with them. Many other suppliers, including Direct Energie, eni, and Lampiris, offer gas supply plans that guarantee savings compared to the regulated tariffs. Call Selectra's English speaking customer helpline at 09 87 67 37 93 or get a free callback to find the best plan/supplier for your natural gas needs. We strongly recommend setting up your natural gas supply plan before GRDF connection construction is finished, as activating a gas meter can take up to 10 business days. The standard gas account activation fee (which goes to GRDF) is 18.06 €. Choose an energy supplier and call them to sign up for a plan. You can also save time and money by calling Selectra's English speaking helpline (09 87 67 37 93) or asking for a free callback, to find a supplier and plan suited to your needs. When subscribing to an energy plan you will need to provide your full address (so that the advisor can find your meter's identifying number - known as the Point de Comptage et d'Estimation, or PCE), the name of the previous occupant (if applicable), and for your banking details (RIB). Your chosen energy supplier will arrange for an appointment with a GRDF technician to activate your meter. You will be charged for activation on your first bill with your energy supplier, which will include the amount on GDRDF's behalf.